I see from your “Meet the Gang” page that Caster is the newest addition to your family. I’m guessing, given that he joined your family in January 2014, that he must be a little over 2 years old now. You mention in his bio that you found him distressed and crying in the woods. Tell us more about your first meeting with Caster. What was the progression from him being distressed in the woods to those first initial days as one of your gang? KCC: It was a rainy Saturday morning, and my husband and I hadn’t gotten out of bed yet when we were woken up by the sounds of a crying cat. The cat sounded like it was seriously distressed, so I got out of bed, threw my coat on, and headed out into the rain in search of the cat. I was nervous about what I was going to find – maybe an injured or mangled cat that had been attacked by an animal. I followed the sounds of the cry around the back of our apartment building and into the woods behind it. I was only a few steps into the woods when I saw the cat. We made eye contact at the same time, his eyes grew wide with relief, and he ran towards me and jumped into my arms. It was like a moment straight out of a movie. I was stunned for a second, but I put my arms around him and carried the wet and muddy cat back to our apartment. He wasn’t hurt at all – just scared, lost, and cold. We had to keep him in the bathroom at first, as we didn’t know if he was safe to be around our other cats. As soon as the nearby vet office opened that morning, we gave them a call and brought the cat in to get scanned for a microchip and to get FIV/FeLV tested. The vet estimated that he was about a year old and healthy, and thankfully he tested negative for FIV and FeLV so it was safe to introduce him to the rest of the gang when we got home. He didn’t have a microchip, however, so we were back at square one in regards to finding who he belonged to. 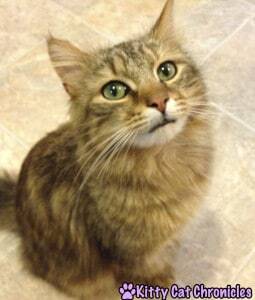 As he wasn’t our cat, we decided to hold off on neutering him because we didn’t know if his owners might have kept him intact intentionally. When we got home, I made “Found Cat” signs and put them around the apartment complex and surrounding neighborhoods, and I posted his photo on Facebook and Craigslist. I felt sure that he must have belonged to someone, as he was healthy and well maintained. However, after a couple of weeks of no one claiming him, we decided to go ahead and get him neutered and vaccinated, and we welcomed him into our family. We had already grown attached to him anyway, and we had named him Caster. The rest of the gang took to him pretty quickly too, without incident. Caster was now officially one of The Gang. Wow! That does read like a scene from a movie. It sounds like you were both very lucky to find one another. It’s interesting that he wasn’t skittish at all, really makes you think that as you say, “he must have belonged to someone”. Life works in mysterious ways and the great news is that he found a happy and healthy home. Before I move on to the next question, I just wanted to reinforce three excellent practices you demonstrated upon his arrival. You enacted a solid biosecurity principle in terms of segregating and quarantining him from the rest of your Gang before you had a chance to have him tested for FIV/FeLV and confirm that he was indeed not a biosecurity threat. You respected the other owners potential wishes (i.e. not neutering straight away) and made a concerted effort to find the original owner. You went back to the vet once the decision was made to bring him into the fold and you had his base health needs attended to. That’s great stuff! A great example that we can all learn from. With Caster now incorporated into your Gang. I’m sure his new digs were a welcome respite from the cold and muddy wetness that you found him in. How would you describe his health generally, were there any other return visits to the vet before the incident with his eye? KCC: He was in good health when we found him. He didn’t seem malnourished, and he wasn’t injured in any way. He just needed a bath and some lovin’. Going forward, he has maintained his good health. Aside from the incident with his eye, he’s only had to go to the vet one other time since we’ve had him, to be treated for a cold. Nothing serious. Ah yes, the “incident with the eye”. Given that our conversation started with your comment on our post titled “My pet has three eyelids. Is it an alien?”, I’m really interested to hear more about the events that led to your first hand introduction to the fact that Caster does indeed have a third eyelid. Can you tell us more about the incident? KCC: My husband and I got up one morning and started to feed the cats breakfast, and we noticed that Caster’s left eye was mostly closed and watery. I tried to open his eye lid to see what might be the problem, and all I saw was a white membrane that was covering most of his eye. I had never seen anything like that before, and I thought something was seriously wrong. He and one of our other cats, Delilah, frequently rough house, and I thought that Delilah might have scratched his eye really badly, that the white membrane was damage to Caster’s eye. Of course we called the vet right away and got an appointment for that afternoon. We took him in, and the vet took one look and explained that the white membrane was just Caster’s third eye lid. I was relieved to hear that was normal, but I was still concerned as to why his third eye lid remained closed. He wouldn’t let the vet get a good look at his eye, so she had to give him a sedative. It took two sedative shots to get him to relax, and when he finally did, the vet was able to open his eye enough to see that he had an entire nail sheath stuck in his eye. She removed it with a pair of tweezers and was completely amazed by it – she had to take it around and show the other vet and vet technicians the nail. Surprisingly and thankfully the nail sheath hadn’t scratched or damaged Caster’s eye at all. It was just irritated. She gave him an antiobiotic anyway just to be on the safe side, along with an ointment I had to put on his eye twice a day for a few days. She also sent the nail sheath home with me in a little ziploc bag. I still have it! MOL! With taxes, the total came out to be $206.30. Not a cheap vet visit! Our cat had an entire nail sheath stuck in his eye. Total came to $206.30. Not a cheap vet visit! I love the reaction from the veterinarian. It’s hard to believe that nail sheath was jammed up under his eyelid, and yet he didn’t sustain any permanent eye damage. Caster is certainly a lucky boy! Did you happen to take a look at Delilah’s nails in an attempt to confirm your hypothesis? KCC: We don’t know how the nail sheath got in his eye. Before taking Caster to the vet, we thought that Delilah had scratched his eye. After finding out it was actually a nail sheath stuck in his eye​​, we realized that we really have no way to tell how it got there. 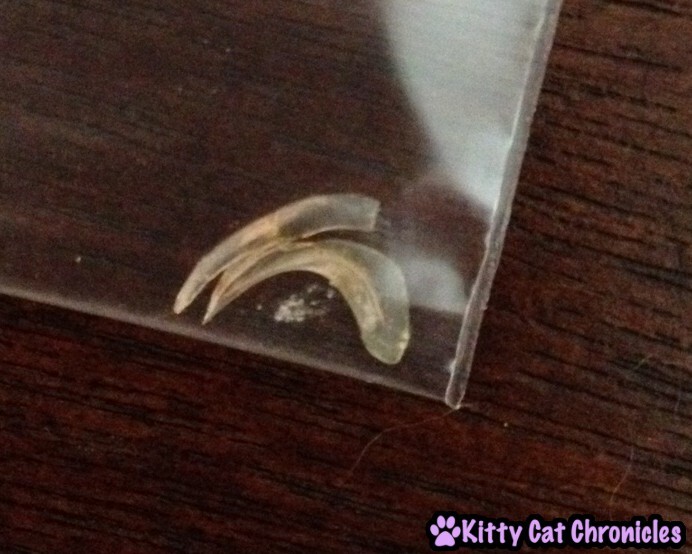 Since cats shed their claws every couple of months, and we have 5 cats (which means 20 paws and 100 claws! ), finding nail sheaths lying around is pretty common. Who knows how he got one lodged in his eye. It could have even been his own! Given the “Cost Breakdown” numbers that you’ve shared with us and the fact that you have 5 cats, it seems like veterinary bills could easily balloon. As a way to cope with the financial risk, do you have pet insurance for your Gang? KCC: No, we don’t have pet insurance. With one FIV+ cat, one with cerebellar hypoplasia, and one with patellar luxation, 3 out of our 5 are not insurable. I suppose we could get insurance on the other two, but we decided that putting money aside every month would be a better option. That way we still have the money if we never have to use it. Also it is easier to manage one savings for all five cats rather than savings for three and insurance for two. It’s great that you’ve thoroughly considered the financial risks associated with pet ownership and that you’ve enacted a fiscally responsible plan. A savings plan is a great alternative to pet insurance. For those that are interested in exploring pet insurance, I strongly suggest visiting our “Smart Guide to the Best Pet Insurance”. I think we’ve got a great story here. Are there any other questions that I should have asked or last pearls of wisdom that you’d like to share? KCC:​ I think you covered everything! I would like to stress that it is important to take your pets to the vet ASAP when you notice that something is wrong. If we had left Caster’s eye untreated, it could have been a lot worse. He could have developed an infection, and the nail sheath could have eventually scratched his eye. We noticed it early, got him to the vet that same day​​, and were lucky that he didn’t sustain an eye injury or infection. ​Thank you for taking the time to do this interview! I’ve enjoyed our correspondence and look forward to reading the final story! That’s great advice indeed. Emily, I really enjoyed our Q&A and certainly appreciate you taking the time to participate in our “Smart Tales” series. 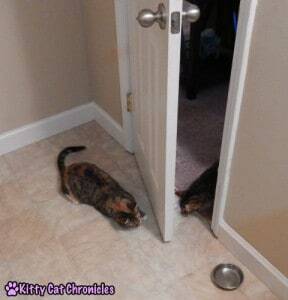 We look forward to following along with your adventures over at Kitty Cat Chronicles! Thank you so much for interviewing us and featuring Caster! It’s going to his head, of course – he thinks he’s famous now 😉 We enjoyed reading the final interview and appreciate the time you put into this. We look forward to reading more “Smart Tales”! Lovely interview! 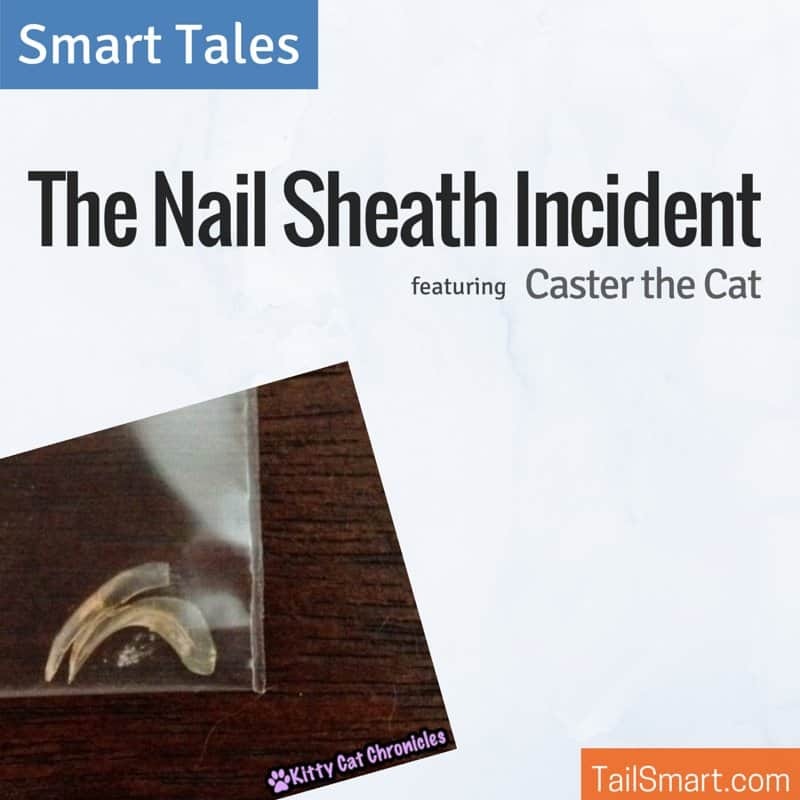 I’m glad Caster was OK after the nail incident. I think we need a DNA test on that sheath. I am glad his eye was OK after that.